First impressions can last a long time, and in the world of hammocks, some simply perpetuate stereotypes from misinformation. For example, I spend a lot of time educating folks who think hammocks are uncomfortable thanks to their impression of laying like a banana. When Maverick Gear debuted their hammock, I heard it besmirched as a “coffin” or “canoe,” but what a lot of people missed was the innovative and truly flat bed produced by combining the catenary support structure of a bridge hammock and the cot-like framework that girds the underside of the hammock. Another claim laid out by some in the community was that this hammock is too heavy. While I am glad to see that hammocks are being recognized as a lightweight shelter solution, they are by no means the lightest shelter category. Let’s be clear: weight is only one of many subjective measures that matter, and it doesn’t necessarily matter to everyone. No, I wouldn’t characterize this hammock as lightweight and suitable for backpacking[1. In the base configuration, the hammock is close to 8 lbs (3.6 kg), which makes it one of the heaviest single-occupancy hammocks. You can remove the “exoskeleton” frame and drop close to 4 lbs (2 kg)], but that doesn’t mean it isn’t an option for bike touring, car camping, base camping, and other adventures where weight is a non-issue. MANUFACTURER RECOMMENDATIONS Weight limit 331 lbs and length 6’10″ or 150 kg and 210 cm. When I first set up the Maverick, I was struck because this is what I originally envisioned when I first heard of a “bridge-style hammock.” Folks often use the bridge metaphor when describing these inline hammocks that use a catenary structure and spreader bars to allow a flat head-to-foot lay. But what is often glossed over is that there is curvature between the spreader bars, often curling the shoulders. In contrast, the Maverick is completely flat—left to right, head to foot. In fact, to describe this hammock as a floating cot is more appropriate. I have never slept in a hammock that offers a flatter lay. Period. In fact, when I describe the lay of a regular hammock, I often describe it as “ergonomically flat,” admitting that there is some slight curvature, but this is due in part to the way the hammock wraps and supports the pressure points in the body. The Maverick hammock is strictly flat. 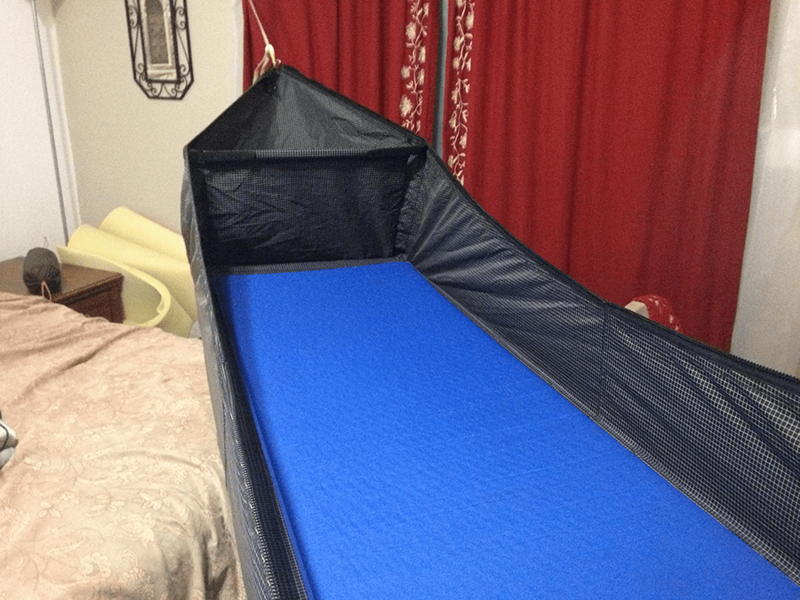 This is good news to stomach and side sleepers who have avoided other hammock styles or folks who prefer more traditional beds or cots when sleeping. Once the Maverick is set up, the bed is drum tight. Literally. I had my own jam session until my wife told me to cut it out. Jeff, the owner, tells me that due to humidity differences, this firmness will relax, but in my dry climate, it has remained very tight. This is important to note for some folks because the bed doesn’t have the same ergonomics as other hammocks, meaning, it offers a fairly firm lay. The head and foot storage areas are nice. 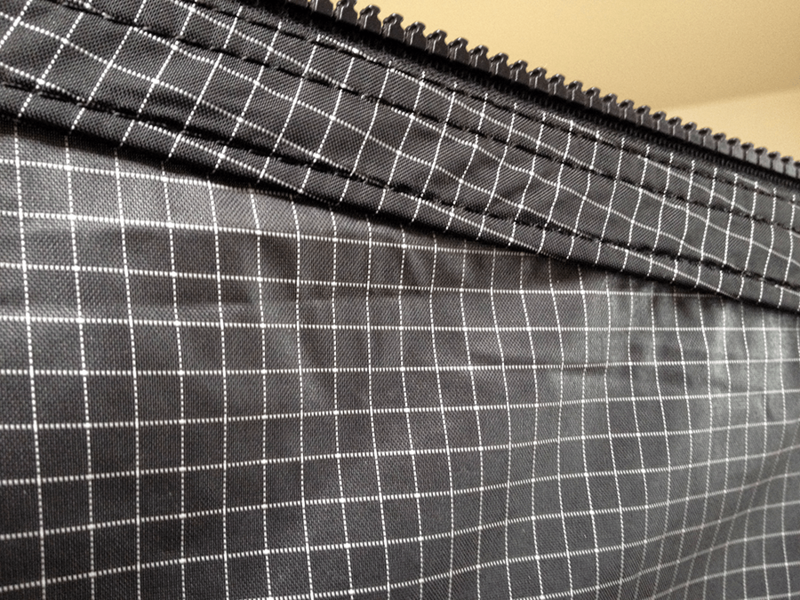 A simple fabric panel separates the main hammock body from the storage areas, which can be removed or adjusted with the hook-and-loop fasteners. I like that I can toss gear behind my head and have it secure from the rest of the hammock. The Maverick is built tough. I remarked to Jeff that the zippers appear “military grade.” He agreed. The hammock is designed with strength and durability in mind. The Dyneema fabric, for example, is tough and strong, and is often used to reinforce backpacks to keep them lightweight yet remain durable. The Maverick uses Dyneema throughout its entire construction. The build is very fine, with flawless stitching and a very polished finish. Small details like tabs to cover where the zippers meet, and the removable storage areas, show the well-thought-out process taken on this design. No corners were cut on this hammock in terms of quality and process. This is a hammock that is built to last. Thanks to the included hexagonal tarp, staying dry in the hammock is easy. 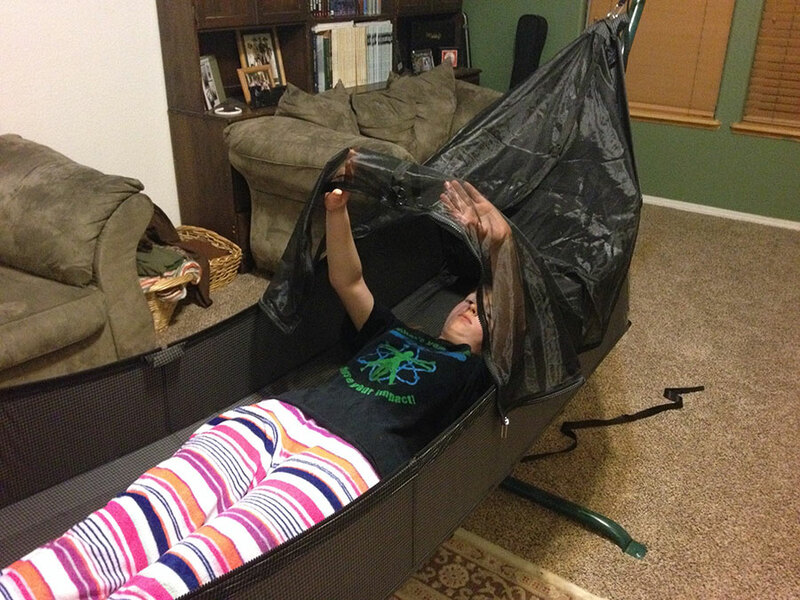 The tarp is a great match to the hammock and offers a spacious interior. The included pegs are adequate for the job, but are probably the one accessory I would upgrade. Staying warm is actually very straightforward. Because of the ribbed structure underneath, using a traditional hammock under quilt is less effective. A custom quilt or insulation could be inserted through or around the ribbing, but it is a little tricky and not worth the trouble. The best solution is to use regular sleeping pads on the inside of the hammock. Traditional sleeping pads work well inside the Maverick hammock. This is what the hammock looks like with the bug netting completely removed. You can set up and use this hammock without the bottom frame, which turns the Maverick into a typical bridge-style hammock with just the spreader bars on the head and foot ends. This saves nearly 4 lbs (2 kg) of pack weight. It is best to use a thick, stiff pad to help flatten out the bottom as much as possible. Personally, I didn’t like this option as it curled my shoulders a lot and I felt squeezed in the bottom. This is because the spreader bars aren’t that wide, in comparison with the other bridge hammocks (26 in/66 cm on the Maverick vs. 36.5/93 cm on the Warbonnet Ridge Runner). The final pack weight without the bottom frame still hovers around 4 lbs (2 kg), which is heavier than I would recommend for a single-person backpacking shelter. If you’re looking for a bridge hammock that is light and less bulky to pack, I would go with either the Warbonnet Ridgerunner (44 oz/1.2 kg) or the Jacks R Better Bear Mountain (38 oz/1 kg). Out of the box, this hammock has some assembly required. The bug net, for example, can be completely removed. This can be a weight and space savings for those who don’t need it during certain trips. My kit came with the bug net already removed, so this is one of the first things to add on. The spreader bars are the longest of all the metal tubing provided in the kit. These can be added into the peg slots and can remain attached while packing and storing. The plastic corners keep the frame structure in place. Once the spreader bars and bug net are attached, the only regular assemble/disassembly is the cot structure. Set-up is actually pretty easy after a first try. I wish the metal poles that make the box frame included shock cord, which would speed up assembly and also keep all the components connected and separated appropriately. The head and foot bars of the frame have plastic corner pegs that are permanently attached to the bars. These bars slide into position and then the longer side bars slide into position. The final step is to hook on the fiberglass “ribs.” It is important to attach these correctly otherwise you can bend them too far and break them (I did this, so learn from my experience!). The C-clip has a thick and a thin edge. 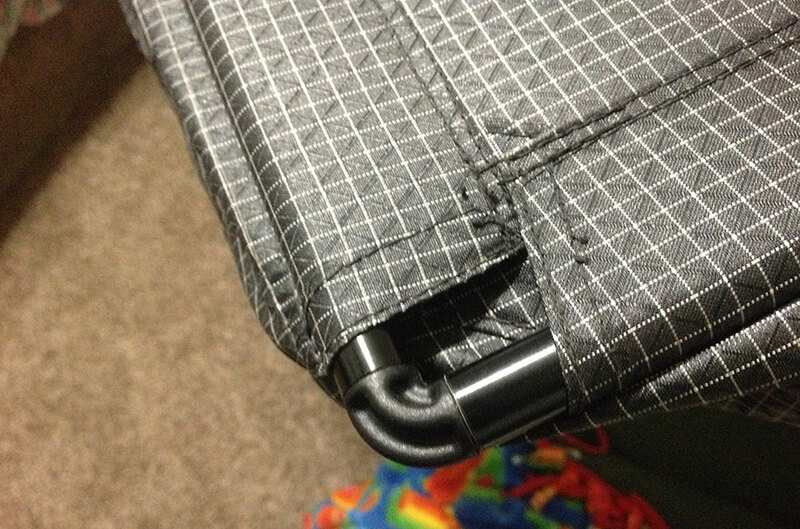 The thin edge is on the inside of the hammock and the thick edge is on the outside. Clip the rib to the frame side closest to the body and then bend the rib down to clip it in the opposite side (I grab the pole like I’m pounding my fist on the table). Like all spreader-bar hammocks, you actually set the anchor point about a foot (30 cm) lower than is typical, since the spreader bars raise the hammock up by design. The included suspension uses a cinch buckle, but Jeff has added a nice pull tab that makes releasing the tension a breeze. I like it so much, I highly recommend it to anyone who uses cinch buckle suspension. Take-down has been my biggest struggle with this hammock. Due in part to how dry my climate is, the hammock remains very tight and firm. Unhooking the ribs requires a tug in the opposite way of setting up. Taking apart the outer frame should be as simple as pushing against the short head or foot poles and disconnecting them from the longer side poles. Additional “action” photos are available on the Maverick website. For folks who are are looking for a more bed-like experience, the Maverick nails it. It works great with traditional camping pads and sleeping bags and fits a more mainstream mindset. The frame and bowed ribs eliminate any crossbar contact for a firm, flat lay. 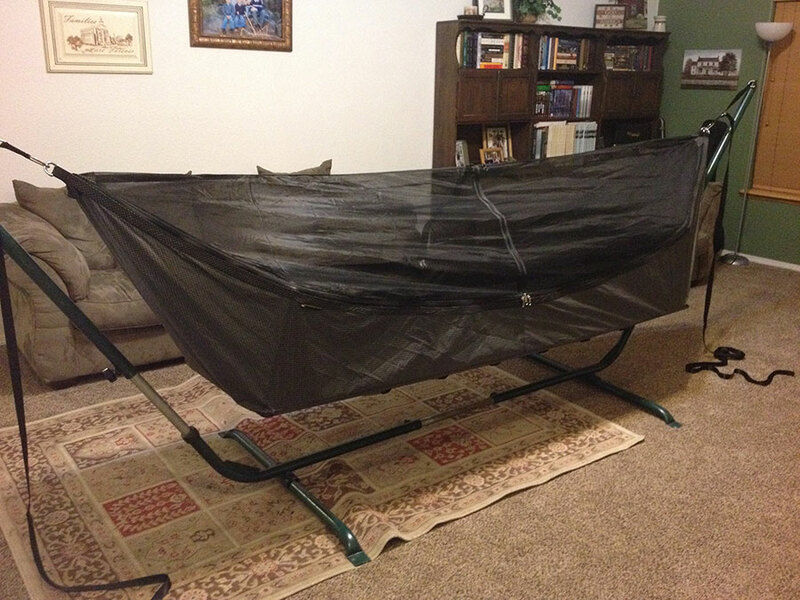 The hammock is also sold as a kit, with bug netting, tree-friendly suspension system, and tarp included. This makes the Maverick ready and intended for outdoor use from the get-go. The removable bug netting make this a great backyard and indoor hammock option as well, or for seasons and locations when bugs aren’t a problem. And while the hammock is currently too heavy for me to recommend it backpacking, but perhaps with innovations in materials or construction, Maverick may come out with lighter versions in the future. Base camping is currently ideal for this hammock. The sidewalls on this hammock are pretty high, and this is probably my biggest complaint in actually using the hammock. Like a gathered-end hammock that is pitched too tight, you end up with a bucket seat scenario with your knees pulled up high (this is also similar to to the Jacks R Better Bear Mountain bridge hammock). I don’t know if the design could be altered to lower these side walls to make entry and exit easier, but that is my recommendation. The innovative hybrid design is amazing and well-constructed, but its weight and complexity limit its use of base camping. Sleeping comfortably off the ground is one of the main reasons to use a hammock, but cots are also effective at keeping folks off the ground, and some cots are comfortably chair height, making ingress and egress easier. The decision between using a cot and choosing the hammock might be a tough one. The Maverick blends the hammock and cot ideas together. The Maverick is about half the weight of traditional military-style cots, but in design is closer in style to the lightweight (2 lbs/907 g) LuxuryLite UltraLite Cot from Therm-a-Rest. Other advantages to the Maverick include setting the bed at a more comfortable sit height, pitching over uneven terrain, and staying above mucky ground—all advantages of the hammock style. The Maverick’s ribbed structure keeps you separated from the frame structure when laying down. In contrast, some traditional military cots can put your body in direct contact with the frame, which can be uncomfortable. So, while there may be some debate on whether the weight and complexity are worth it, when adding comfort and the flexibility of the hammock, the Maverick is an easier win over a cot. 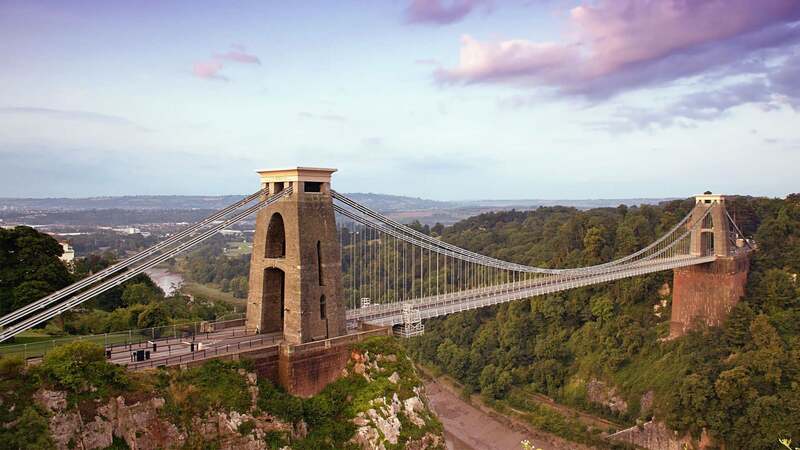 Fantastic Review! Thanks For Sharing! Great review as always. I contacted the makers of this hammock before your review to ask about its strength and structure without using the frame. They list the weights out separately on the site and encouraged frameless use for backpackers who want the lighter weight (it’s a 3.3lb savings). I’m curious about this option. Could you try it out without the frame and report back? The biggest advantage would be if the main rectangular compartment kept its shape fairly well with only a sleeping pad. I’d order this tomorrow if it did. Along the same lines, do you know of any other hammocks with this boxy bathtub style instead of the typical catenary structure? I really want a hammock I can lay on my stomach or side comfortably and use a warm sleeping pad instead in most conditions instead of an underquilt. Chris, yes, I did try this hammock without the frame but it looks like I didn’t mention the results. I’ll go back and append the review. In short, I didn’t like it because of the tight shoulder squeeze. This is because the spreader bars aren’t that wide. If you are looking for a bridge-style hammock you can take backpacking, there are three other options that I would recommend above the Maverick due to weight and bulk considerations (Jacks R Better Bear Mountain, Warbonnet Ridge Runner, and Eureka! Chrysalis). All of the bridge hammocks I’ve reviewed allow you to sleep on your side and stomach. The maverick hammock, with the frame, is the most supportive when stomach sleeping than the others. Thanks Derek. That’s helpful. I’ve seen your reviews of the other 3 bridge hammocks and was hoping the “canoe” design would allow less shoulder squeeze. I think of everything I’ve seen, I might go with the Bear Mountain. Thanks for the advice. If you use the Maverick with the frame, there is absolutely no shoulder squeeze. It is super flat. The downside is that it is heavy and bulky. The bridge hammocks with the least shoulder squeeze are the Chrysalis and the Ridgerunner. 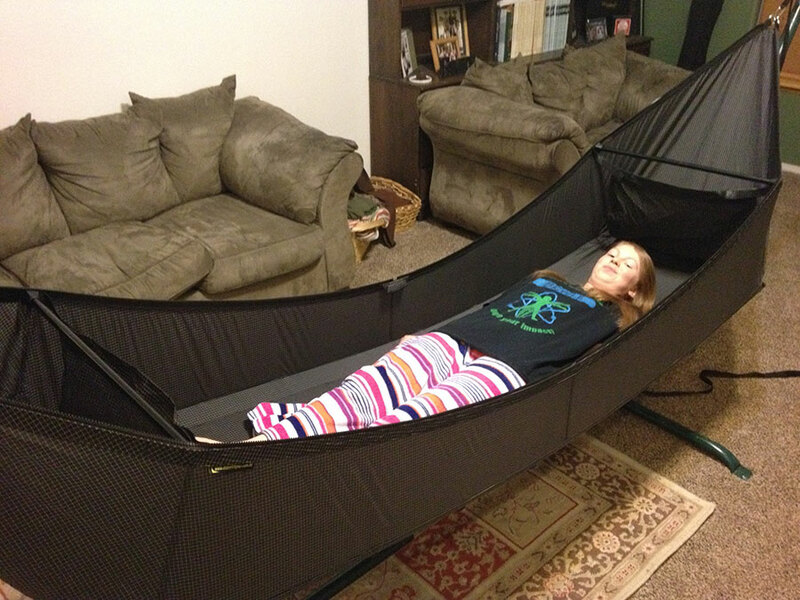 best hammock for sleep quality ever, period!! It could be the best hammock out there hands down, but I’d like to see a couple improvements like head or foot entry like the old sipper-less Hennessy hammocks. that would fix the zipper issue when tensioned. Also use lighter materials to get weight down. That being said I’d choose this hammock over all my others if I had to choose one!!! I should do a video review on this at some point.